"GameChange is one of the few companies to pass the rigorous demands of the ETL/UL 2703 testing requirements." 10/07/14, 03:42 PM | Solar & Wind | AXYS Technologies Inc. The system will be used as part of a research and development project supporting offshore wind generation. 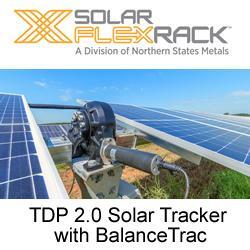 Denver, October 7th 2014 – S:FLEX Inc., manufacturer of racking solutions for photovoltaic rooftop, ground mount and carport systems, is now offering a new Standing Seam Clamp to serve the growing demand for commercial standing seam metal rooftop projects. GrandViewResearch.com has announced the addition of "Market Study - Global Solar PV Market Expected to Reach 489.8 GW by 2020" Market Research report to their Database.